it's time to pass on the award nancy gave us! 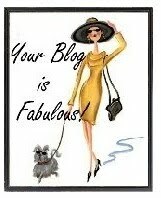 we do think you are fabulous and look forward to hearing about your five obsessions! wow, i just stopped by to catch up with your obsessions and now this... thanks so much!